College of Western Idaho (CWI) is welcoming the community to the Connections Open House, a college wide open house occurring at four locations on April 25, from 4-8 p.m.
Attendees will explore college programs and areas of interest at CWI locations from Boise to Nampa. Programs for exploration include career technical, academic, and workforce development. It is anticipated that over 60% of jobs in the near future will need some sort of professional credential, certificate, or degree. 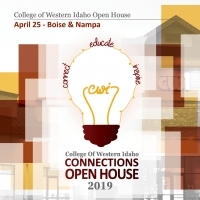 CWI is the southwest Idaho’s training and educational center for many of those needs.